Submitted by Stonehammer on 2018-11-11 09:42. Drop the relevant files (c_nasher.mdl and c_nasher.dds) in your overide or drop it in a hak. Edit: 11132018 I have uploaded a separate zip containing the same model but with the most basic original content animation for the overides. Holy snap, Stonehammer. This is amazing work. Those greaves need to be PC parts!! It's like "I am surprisingly okay with the idea of being kicked in the face with these metal boots because I want to bring them very close to my face very quickly so that I can rub my face all over the highlights along the calf and shin anyway". This kind of thing is the reason why we need a rainbow-vomiting heart-eyed smiley. Well the plan is to get all those parts as armor pieces so everyone can cosplay as Nasher in game, (for the Nasher set anyway). inventory icons are a bit of a pain (I redraw them by the pixel)but should be done soon.
! I've an inventory-icon-crafting tip for that, in case you didn't know it yet: Viewing the .mdl in the NWN Explorer is a quick way to get an accurate inventory icon. You can isolate the coloured parts by setting individual colour channels to pure black, and it lets you rotate and scale the model as needed. That's pretty neat. The old textures are a treasure trove. :-D Dare you to use the c_horse.tga texture (or the entire c_horse model) to make something someday. "This kind of thing is the reason why we need a rainbow-vomiting heart-eyed smiley." Only you and Fester need that! It's nice you made a unique model for him. 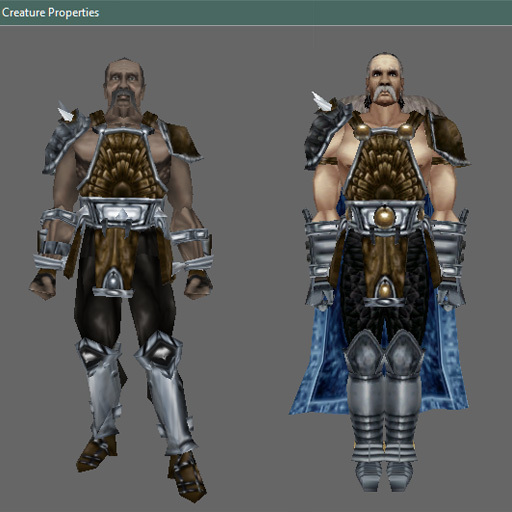 I simply go and replace all subpar unique models with dynamic npcs with custom armors made to look like their portraits. Looks much better and gives you plenty of freedom to customize their appearance in any instance throughout a module. As for his actual appearance, it's certainly quite peculiar... In NWN2 he looks completely different, along with the rest of the game, which went a very different route in concept art, but it's kind of a trade off. It makes sense Nasher looks a little more barbaric given his adventuring days in the Savage North. He should look more like a Jarl than a higher medieval king, bit on the other hand, Neverwinter would also need look like a city in Skyrim for it to make sense, less like the sprawling metropolis it actually is in both games. 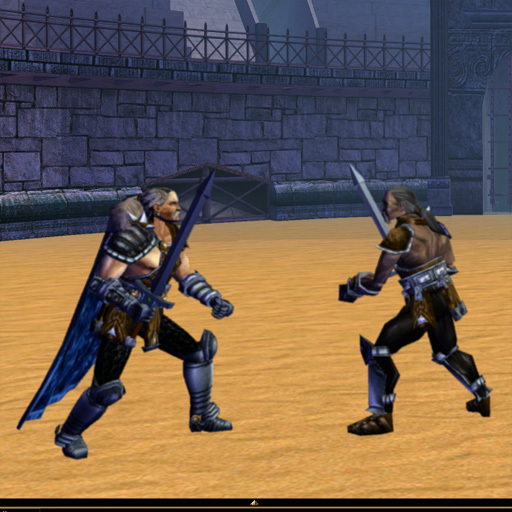 NWN1 Nasher looks very out of place as leader to Neverwinter. It looks nice but the animation doesn't seem to work right. I tried in a hak and the override. Not sure what causes this. It looks good. And animations look right. I would have gotten back yesterday but somethings came up. Thanks for the fix.